First off: I have not seen (or do not recall seeing) the 1956 version, starring Charlton Heston. Secondly, I’m not going to get into the “original vs. remake” thing here, since Heston’s movie was already the third film adaptation of the source material, Lew Wallace’s 1880 novel, Ben-Hur: A Tale of the Christ. But I will say this. 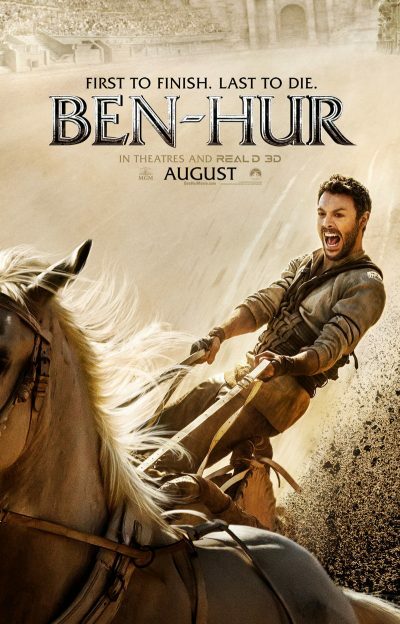 Virtually the only thing I know about Ben-Hur v.Heston is it contains chariot racing. Virtually the only thing I knew about Ben-Hur v.Huston is it would contain chariot racing. Based on the trailer, I expected this to constitute about 40% of the film’s running-time, with one-third being the hero rowing a galley, and the remainder a mix of marching, Romans getting punched, and Morgan Freeman in dreadlocks. 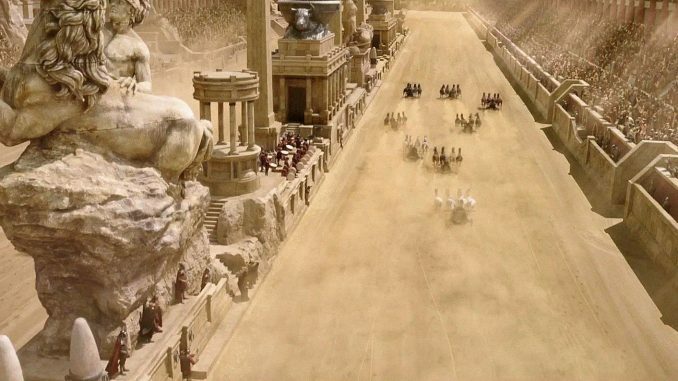 I was basically expecting something like Gladiator with chariot racing, in which Ben-Hur (Huston) works his way up through the ranks, before a final face-off against his former friend, now Roman officer and nemesis, Messala (Kebbell). Imagine, therefore, my disappointment to discover the film contains only one actual race. It’s undeniably a good one, all the more impressive for being done mostly in practical fashion, rather than with CGI. But it’s only the last ten minutes of the movie, and getting there requires you to sit through too much marching, Romans getting punched – and, yes, even too much Morgan Freeman in dreadlocks. I hadn’t realized how much the original book was a phenomenon. After a slow start to sales, it took off and eventually trailed only the Bible among book sales in the United States, holding that spot for decades, until passed by Gone With The Wind. It’s as much a religious tract as a thrilling adventure story, and Ben-Hur v.Huston seems to be trying to go down that road too, more so than v.Heston, by all accounts. As an agnostic, I was neither bothered by nor particularly appreciated the scenes featuring Jesus. However, thanks to Monty Python, any film taking place in this period is always going to struggle to be taken seriously. Yes, I did burst into a chorus of Always Look on the Bright Side of Life at one point. You knew it was inevitable. Film-makers are going to be on thin ice, when their product is inevitably compared to, and found wanting beside, a predecessor which won 11 Oscars. In this case, although mostly serviceable, rarely dull and not short on spectacle (as well as containing that guy from Borgen), I can see why it bombed at the box-office, taking $50 million less worldwide than v.Heston did, half a century previously. It occupies an uncomfortable middle-ground not likely to appeal massively to anyone. Compared to the likes of the Spartacus cable TV series, it’s extremely mild beer in terms of content; hell, even Vikings is grittier. Yet it is perhaps still too violent as entertainment, for those who might be attracted by the faith-based aspects. As a result, it’s destined to be rapidly forgotten: more like Ben-Who?, amirite?